David Whish-Wilson is a respected name in Australian Crime Fiction, and his trio of novels Line of Sight, Zero at the Bone and Old Scores shine a light on the possibilities of a seedy Perth underbelly in times of recent memory. In his fourth novel, The Coves, just recently published by Fremantle Press, he takes a slightly different angle with a foray into the genre of historical crime. 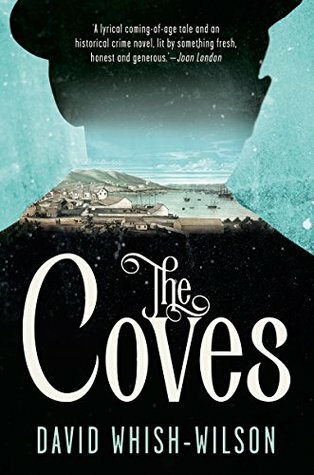 The Coves is the story of twelve year old Samuel Bellamy, who makes his way to San Francisco aboard a ship full of convicts during 1849 with the intention of finding his mother, whom he believes to be among the Australians living there. Drawing from the historical record, Whish Wilson vividly recreates the 'Australian quarter' of San Francisco, a town run by the Sydney Coves, or the Sydney Ducks as they were sometimes called. The novel is peopled with murderers, drunks, prostitutes and scoundrels, and all are seen through Sam's keen eyes, helping the reader to go beyond these labels and understand that people are not always who they appear on the surface, though it may be a matter of survival for them to appear this way. From the prostitute who becomes like a surrogate older sister to Sam when he is alone in this new place to the lawmakers who serve their own interest, the cast of characters in The Coves is almost Dickensian, but with a tough, Aussie Larrikin twist here and there. No wonder the early praise for this novel has been garnering comparisons to Oliver Twist. For me, the novel more strongly evoked echoes of Peter Carey, with strong literary writing that sometimes required deep focus to get at the heart of what was really being said. It takes great skill to write characters who are wise beyond their years, but with Sam, David Whish Wilson has achieved just that. He is not as innocent as perhaps a twelve year old may be today, instead streetwise and savvy through necessity, yet his perspective on the world is not yet jaded like some of his older counterparts, and his capacity to still believe in the possibilities of love, happy endings, reunions and so forth drive the story forward. This is the story of a young man who could turn to crime because of the childhood he has had, but instead tries to do the right thing always (at least from a moral point of view if not a legal standpoint); a young man who is loyal, observant and loves his dog. If you're interested in hearing David Whish Wilson talk about this book, you can still get tickets to hear him speaking to Tim from Dymocks Subiaco this Wednesday night at BARK on Hay Street. Follow this link for more.